Golden Bridge is a famous bridge in Da Nang Vietnam. 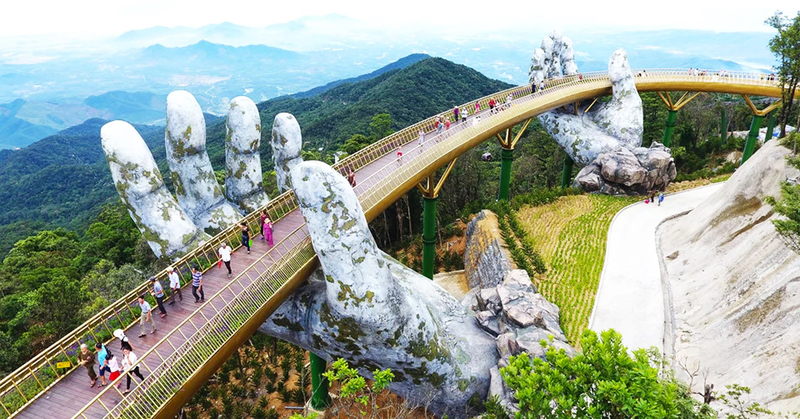 Golden Bridge is located in Thien Thai Garden of Sun World Ba Na Hills. It is located 1,414m above the sea level. The bridge is connected to the Marseille and Bordeaux stations. So it is to take guests from the foot of the mountain or the French village to visit the flower garden. In the middle of the air, the bridge looks like a brilliant silk. Its length is 150m, including 8 spans, the longest span is 21.2m. The exact location of Ba Na Hills where the Golden Bride resides is An Son village, Hoa Ninh commune, Hoa Vang district, Danang. To come here, you have to buy the ticket that is valued for not only the bridge but also the 2-ways cable, the wine cellar, Le Jardin gardens and most games in Fantasy Park. 08.30 am: Our tour guide and private car will pick you up from your hotel, then transfer to Ba Na Hills. In the morning, you will take a cable car from Dream Stream station to Ba Na station to visit Debay Wine Cellar - a unique work built by French architects and was dug deep in Ba Na Mountain in 1923; Le Jardin D’Amour – 9 flower gardens with 9 interesting stories in 9 unique architectural styles; Linh Ung pagoda - the pagoda located at around 1,500 meters above sea level. Lunch is arranged by yourself. In the afternoon: You will visit the “Golden Bridge” – a new beautiful check-in location in Ba Na Hills. This design makes visitors feel like they’re taking a stroll on a shimmering thread stretching across the hands of gods. From here we can see the amazing beauty of Danang City. Then you will visit and play games at Fantasy Park - the largest indoor amusement park in Vietnam. Back to the cable car and return to your hotel at 5.00 pm.